This would show all Excel sheets where the name includes Foo in the spotlight results. 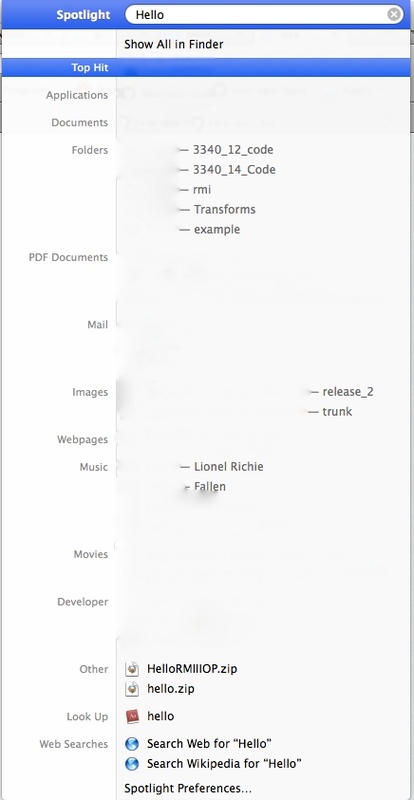 If the name of the files was the same, Spotlight would show the name of the containing folder right next to the name of the file. Unfortunately I don't have a screenshot of this available. The displayed name of the containing folder was helpful in deciding which file I wanted. 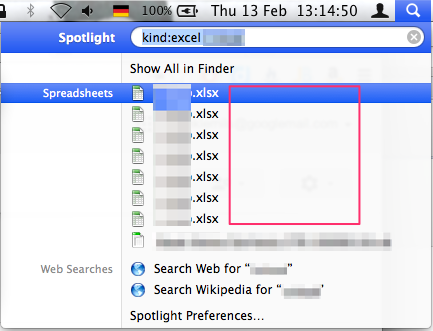 In Mavericks, the folder name is no longer displayed next to the search result - see screenshot. Is there a way to enable this in Mavericks? I know that I can show the file location when hovering over the item in the search results and pressing Cmd, but that's not what I want. Hold down Option and Cmd to get the full path while moving the mouse over the hits. Kinda nice now I know. Hold those two keys while clicking on the preview causes Spotlight to open the Finder at the hit location; very convenient! For me it's working fine. It shows the folder names when the file names are identical. Here I searched for music files and it still shows the folder names: Strange. Hold down ⌘ Cmd and then it shows the path. On my 10.9.2 install holding CMD while hovering over Spotlight search results adds additional content from sources that Spotlight can preview to the preview pop-up, but for sources it can't generate a preview for (e.g., a unix executable) it shows only the filename. To get the COMPLETE path or URL to show up I have to hold down BOTH CMD and Option while hovering. Wonder if there's a writeable pref to toggle this on by default? Hovering over spotlight result opens preview pop-up. If you hold both OPTION and CMD, it will just display the path to the file. Not the answer you're looking for? Browse other questions tagged macos mavericks spotlight . Can Spotlight be configured to search ALL files on the hard drive (or is there a powerful alternative) - like Windows' Start Menu search can be? 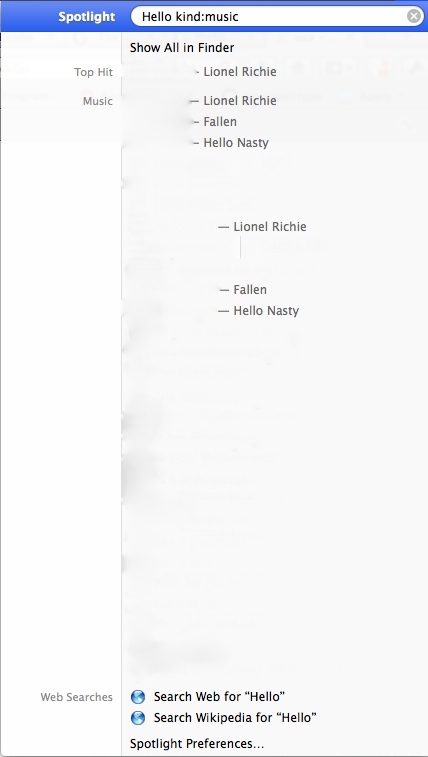 Is there a way to show Spotlight indexing status/progress in Yosemite? Why does Spotlight pick the DVD Player app when I enter the math equation 5*3? Why can't Spotlight in El Capitan easily find the obvious?